What is pink eye? Pink eye is a disorder of potato tubers that can cause costly storage losses for potato growers and can reduce tuber quality to the point where tubers will be rejected by potato processors. Pink eye not only directly affects tubers, but also makes tubers more susceptible to diseases such as Pythium leak, bacterial soft rot (see University of Wisconsin Garden Facts XHT1224), pink rot, and Fusarium dry rot. These diseases cause additional storage losses and reduction in quality. Pink eye is characterized by a pink discoloration of the skin of potato tubers. What does pink eye look like? Pink eye is characterized by a short-lived external pink color that is often, but not always, found around the potato eyes of freshly harvested tubers. Eyes at the bud ends of tubers (i.e., those farthest from where tubers are attached to stems) more commonly show pink eye symptoms. Pink eye can eventually develop into corky patch/bull hide, which involves a thickening of areas of tuber skin extending approximately 1/10 of an inch into the tuber flesh. Corky patch/bull hide can make tubers unmarketable for either fresh market or processing use. External pink eye symptoms are often accompanied by brown patches in the tuber flesh immediately underneath the skin. Browning due to pink eye can resemble browning due to other disorders such as internal brown spot or heat necrosis, but these latter disorders tend to occur deeper in the tuber (i.e., inside the vascular ring), rather than just underneath the skin. Pink eye can also be confused with late blight. If there is any question whether the problem might be late blight rather than pink eye, contact your county Extension agent for information on submitting a sample to a diagnostic lab for proper testing. contributes to pink eye development. Environmental conditions that lead to pink eye also promote tuber infections by the pathogens that cause Pythium leak, bacterial soft rot, pink rot, and Fusarium dry rot (all diseases associated with pink eye in storage). 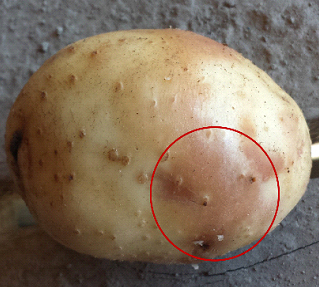 How do I salvage potato tubers affected by pink eye? Once pink eye symptoms develop, they are permanent. If symptoms are minor, tubers may still be usable. However, when pink eye symptoms are severe, symptomatic tubers will be rejected and discarded. How do I avoid problems with pink eye in the future? Growers have no control over the extreme precipitation and high temperatures that promote pink eye development. However, growers can practice management strategies that minimize water-saturated soils and reduce warm soil temperatures, thus reducing the severity of pink eye. To minimize water-saturated soils, deep till areas where pink eye has been a problem, areas where water tends to collect for extended periods, and areas where soils may be compacted (e.g., field entrances or head lands). Deep tillage will break up subsoils in these areas that impede proper drainage during wet weather. Proper drainage will limit periods when tubers will be oxygen deprived and thus more prone to pink eye development. Also, avoid any activities that will cause soil compaction such as operation of heavy and large farm tractors and field equipment when soils are wet. Minimizing water-saturated soils will not only reduce the likelihood of pink eye development but will also help limit development of other tuber diseases. To promote cooler soil temperatures, be sure to manage diseases (e.g., potato early dying) that reduce canopy coverage. Loss of canopy allows soils to warm faster on sunny days, thus leading to higher temperatures that are more favorable for pink eye development. Finally, be sure to scout for pink eye symptoms prior to and during harvest. Knowing the severity of pink eye in a field can help growers make informed decisions about the appropriate duration for tuber storage and the best end use for symptomatic tubers. For more information on pink eye: Contact your county Extension agent. Thanks to Alex Crockford, Stephanie Plaster, and Janet van Zoeren for reviewing this document.